With immense sadness and disbelief, the family of Larry Worobetz announce his passing in Kelowna, BC on Friday, December 7, 2018 at the age of 77 years. He is survived by his loving wife of 50 years, Ruth, and their daughters Tara Worobetz (Kevin Burbank), Tricia Wojcichowsky (Mike), Jennifer Taylor (Ryan) and Jessica Heppner (Darren), ten grandchildren: Nyah and Quinn Taylor, Spencer and Matthew Wojcichowsky, Rylin, Avery, Berkeley and Waylon Heppner and Austin and Eliot Burbank, his sister Sylvia Mierzewski and her family and his brother Melvin Worobetz and his family. He is predeceased by his parents John and Polly Worobetz. Larry was born in Fairview, AB on May 25th, 1941, and spent his early years in Hines Creek. Leaving home at the age of 18, he served in the Air Force for 10 years, working as an air traffic controller. He was stationed in Goose Bay, Labrador, Gimli, Manitoba and Namao, Alberta. During his time in Labrador, Larry took flying lessons and became licensed to fly small aircraft. A lot of time during these years was spent curling and riding his motorbike. His next 2 years were spent working as an air traffic controller for the Dept. of Transport, after which he left to resume his education. He graduated from the University of Alberta, and embarked on a career in Corrections, first with Probation (Provincial Govt.) and after a year, moving on to the Federal Govt. as a Parole Officer, where he remained until retirement. For a time, he acted as the liaison between the Parole office and the Edmonton City Police Dept. In his “spare” time, Larry was a builder, adding on to the back of our house, as well as putting a garage on the front, and adding windows, a deck, and brick patio, and later doing renovations. There were few things that he couldn’t fix. His other passion was gardening. Winters were spent planning next summer’s flower beds. He had a special bond with each of our pets. Our last dog, Molly, was very demanding about her walks, and left him with a well-established walking habit, rain or shine. When the girls were home, much time was spent driving to, and attending many activities, and in the case of Ringette and ball, helping to coach. During this time, we started the tradition of gathering as a family at Shuswap each summer. His vast stores of patience showed as he circled the lake endlessly until each daughter was confident wake boarding. It gave him great joy to continue this tradition with the girls now bringing their own families to the lake. As grandchildren arrived, there were frequent visits to Calgary, Kelowna, and even to Scotland, where two of them were born. He always loaded some tools in the trunk, as there were usually some handyman requests during these visits. 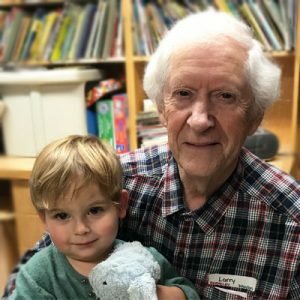 Larry’s last week was spent playing cars and enjoying lots of snuggles with his toddler grandsons Berkeley and Waylon. A Celebration of Life will be held on Saturday, February 2, 2019 at 11:00 am at Sherwood Park United Church, 20 Fir Street, Sherwood Park, AB. Donations to Sherwood Park United Church or to NASAP (Northern Alberta Society for Animal Protection), PO Box 3236, Station Main, Sherwood Park, AB T8H 2T2 gratefully accepted. The service for WOROBETZ, Lawrence “Larry” is scheduled for Saturday, February 2, 2019 at 11:00 am at Sherwood Park United Church. Below you will find the map for the service location and the contact information should you have any questions. We send our deepest Sympathy to all of the Worobetz family. We hope you will find strength from each other, friends and all of your loving memories Tony Terry Minsky Family. I’m also in disbelief. My memories of Larry are so vivid driving Jessica & Beth to hockey practices, games & tournments. When I was diagnosed with breast cancer, both you & Larry visited me in the isolation ward of the Cross and drove me to most of my 25 radiation treatments. I will never forget that support at such a scary time of my life!! Frank, Beth & I send our sincere condolences. We will be in town Dec 21-Jan 1. I would love to visit you. Email me if it’s convenient. We send our love & prayers. About the earliest memory of Uncle Lawrence that I have is of him standing and holding me at the door of our home in Hines Creek. He was in Air Force uniform, talking with my mother, also paying attention to me. I don’t remember if he was just arriving or leaving but my mother seemed very happy and comfortable to see him, talking fluidly. As for me, I was initially startled when he swooped down to pick me up, then shy as he held me in the crook of his arm. Over the years, I saw him infrequently as he had moved away. I always remembered him as a good uncle, a good person and a true friend. I am sad to see him go and I will miss him. Our deepest sympathies to you and your family, Ruth. Larry will certainly be missed.